A new proposal from the Unicode Emoji Subcommittee recommends updating the Sleuth or Spy Emoji to allow for skin tone modifiers. 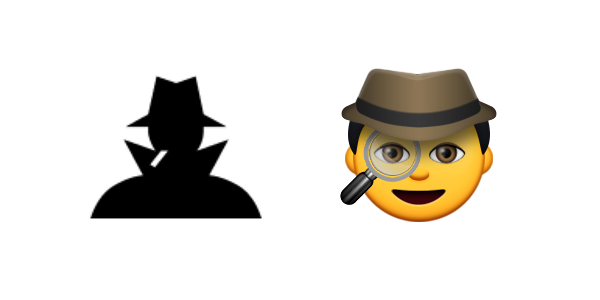 First introduced as part of iOS 9.1, the Sleuth or Spy Emoji (yes, that's what it is called) was approved in June 2014, as part of Unicode 7.0. Vendors use this guidance to decide if an emoji should allow skin tone modification, could allow it, or should not allow it. The reference glyph for this emoji shows a shadowy silhouette, which wouldn't have been an obvious candidate for modification of skin tone when the modifiers feature was released. Above: Reference Glyph next to Apple's emoji image. All of the other similar emoji with visible skin tone respond to emoji modifiers on Apple platforms; this one does not due to its Emoji Modifier Status value, leading to inconsistent behavior. The inconsistent behavior being the fact that press-and-hold allows a choice of skin tones for every human emoji from the bride to the bathing man...except the spy. Above: Emoji modifiers are supported for most human characters, such as the bride. A second (unrelated) part of this same proposal document is the recommendation to include the left speech bubble emoji in the standard additions for emoji data. This character was introduced in Unicode 7.0, but did not make the cut as a standard addition for emoji presentation. Apple recently implemented a Zero Width Joiner (ZWJ) sequence of the eye emoji and the left speech bubble to create a new anti-bullying campaign emoji. Above: The Eye in Speech Bubble ZWJ Emoji Sequence was a mystery at first. ...reflect current practice in which on at least one major platform this is available on emoji keyboards, participates in emoji zwj sequences, and has emoji presentation (i.e. defines its own color). The distinction of which Unicode characters are considered emojis can be somewhat arbitrary. For example, the Pocket Calculator is another Unicode character in the Miscellaneous Symbols and Pictographs range which is not deemed worthy of an emoji presentation. Yet the printer is. Go figure. Apple has released the iOS 9.1 update for iPhone and iPad, which includes 184 new emojis. This makes iOS the first operating system to include every single emoji in the Unicode Standard.